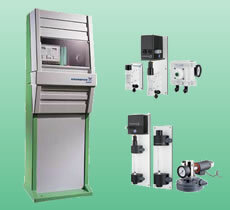 Grundfos offers a variety of disinfection systems to ensure appropriate disinfection for your applications. For sustainable disinfection, Selcoperm system generates hypochlorite (8 g/l) on-site from salt, water and electricity only. Oxiperm system offers a wide range of possibilities for production and dosing of chlorine dioxide as well as Vaccuperm systems for chlorine gas dosing. Chlorine has been used to treat drinking water for more than 75 years because of its high safety standards. It is the most widely used disinfectant worldwide. 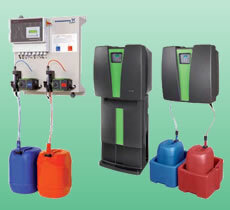 Vaccuperm gas dosing systems work in accordance with the tried-and-tested full-vacuum principle, which regulates the addition of gaseous chlorine reliably and precisely. Grundfos Water Treatment Selcoperm electrolysers produce sodium hypochlorite electrolytically, directly from a solution of common salt using electricity. 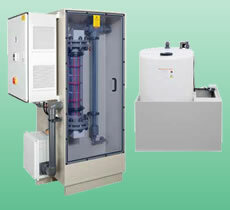 In the electrolytic cell, caustic soda solution, chlorine and hydrogen are generated. The chlorine produced reacts immediately with the caustic soda solution, resulting in a sodium hypochlorite solution, which is the disinfectant. The solution generated has a pH value between 8 and 8.5, and a chlorine concentration of less than 8 g/l. Even relatively small quantities of chlorine dioxide display high disinfecting properties against all critical and chlorineresistant germs, almost regardless of the pH value.